Olivia Frank, a student volunteer in the Medical Surgical Intensive Care Unit, writes an entry in the ICU diary of Jimmy Plevritis, a family member whose father was a patient in the unit. The secretary at the front desk nods. So Ms. Frank, a JGH student volunteer, leaves the sixth floor of Pavilion K, where patients’ rooms are located. Using her fist, she presses the button for an elevator to the second floor. From left: Susan Cameron, a Nursing Educator in the Medical-Surgical Intensive Care Unit; Olivia Frank, a student volunteer; and Pina D’Orve, a Social Worker in the unit. “I’m looking for Mr. Panagiotis Plevritis,” she says, smiling slightly, as she approaches the secretary of Cardiovascular Intensive Care. Ms. Frank makes her way down the hall. But as she reaches the doorway to room 73, she pauses. Things have taken an unexpected turn. Mr. Plevritis, intubated, is sitting up in his hospital bed. His son, Jimmy Plevritis, is seated at a desk in the corner of the room, his head down, an arm covering his face. In tracking Panagiotis’ progress and recording the evolving nature of his care for a viral infection since October 24, Ms. Frank’s role seems anything but traditional. Some might see her as a sort of journalist. To others, she’s one of many blue-jacketed volunteers. However, to staff in Medical Surgical Intensive Care (MSICU), she’s actually more like a support system, providing patients and families with an opportunity to document their experiences in Intensive Care. 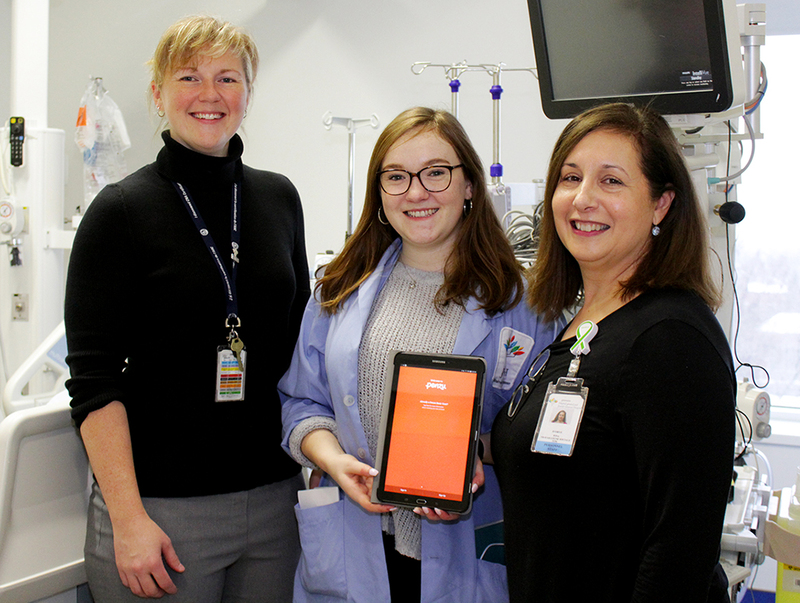 Since September, the McGill University psychology student has been leading the ICU Diaries project. During her two weekly shifts in the MSICU, she speaks to participating patients (if they are able to respond) and their family members, and then uses a digital journal to record their observations, emotions or thoughts of the day. Discharged patients and their loved ones can access the diary virtually, but they can also request a printed copy. The information that’s gathered—in the form of text, videos or photos—is stored digitally on a tablet, using an app called Penzu. Any patient or relative can ask for a diary to be started, but Ms. D’Orve guides Ms. Frank in determining who would be a good candidate. Typically, it’s a patient who is expected to have a longer stay in the MSICU, since this lends itself to the development of a more comprehensive diary. The initiative is an offshoot of the ICU Bridge Program, which enables university students to volunteer by shadowing staff in the Intensive Care Units. The overall objective is to help alleviate the stress that family and friends experience when visiting a loved one in who is in critical condition. Jimmy, whose father was later moved back to K6, was the one who opted to start an ICU diary, because he thought the concept sounded interesting and could yield emotional benefits. “It’s a long book, and every day is a new chapter,” Jimmy adds. Although Panagiotis is no longer in the MSICU, Ms. Frank remains in close contact with Jimmy and still writes entries in his diary. The hope for MSICU staff is to have other student volunteers take part in the ICU Diaries Project during part of their shift on the unit. While the MSICU environment can be tough emotionally, Ms. Frank continues because she feels she’s making a difference.